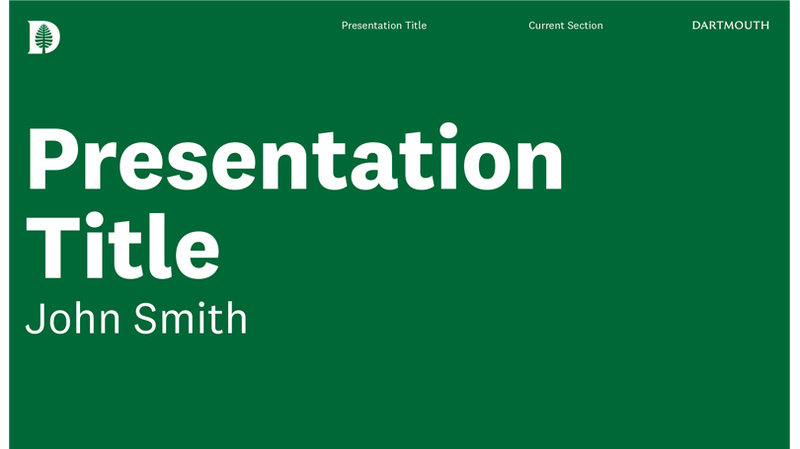 The PowerPoint templates allow faculty, staff, and students to create presentations using elements from the visual identity. The templates contain a number of master slides for different types of presentation slides, as well as examples and recommendations. Both standard (4x3) and widescreen PowerPoint templates are available for downloading by Dartmouth faculty, staff, and students. One version uses Arial as the primary typeface. The other uses National 2. To use the version with National 2, you must first install National 2 on your computer. To download the PowerPoint templates, you will need to log in with your Dartmouth NetID to access the file. After you’ve logged in, click on the “Download” button in the center of the page.